Fresh off the biggest first week of their career, Fit For A King are kicking off their tour with The Devil Wears Prada this fall! They’ll be taking over Mr. Smalls in Millvale on Friday, December 14th. Fit For A King released their fifth full-length album Dark Skies earlier this month via Solid State Records. The album gave the band their best first week in their decade-long history with impressive Billboard charting positions including #2 Hard Rock, #3 Rock, #13 Top Current Albums and #69 on the Billboard 200. The album was streamed over 5 Million times on Spotify in under a week and has secured some great streaming playlist adds across multiple platforms. Dallas, TX – Fit For A King are celebrating a monumental first week for recently released album Dark Skies. Securing charting positions including the #2 Hard Rock, #3 Rock, #13 Top Current Albums and #69 on the Billboard 200, this album has given Fit For A King the biggest first week in their decade-long history. Dark Skies has been streamed over 5 Million times on Spotify,locking in multiple adds to playlists like Kickass Metal and New Core. Featured single “Oblivion” is currently on Apple Music’s The A-List: Metal and Breaking Metal playlists as well. Dark Skies is Fit For A King’s evocative declaration of a hard won victory. “This album is far from happy. It’s about personal struggles,” explains singer Ryan Kirby. “It touches on many subjects relevant to all of our daily lives.” Throughout the album, produced and mixed by the legendary Drew Fulk (I Prevail, Motionless In White, Memphis May Fire), heavy music and melodic hooks are used to honestly explore the dark sides of life. Heralding praise from outlets like Consequence of Sound, Revolver,Kerrang!, Loudwire and Alternative Press, Dark Skies is available to stream and purchase today at https://solidstate.lnk.to/DarkSkies. Fit For A King was built with bootstrap ethics and do-it-yourself vigor. On the strength of the self-released material, the group joined Solid State for a string of successful albums that connected with the downtrodden and dispossessed. Creation/Destruction (2013) debuted at Number 6 on the Hard Rock chart. Slave to Nothing (2014) cracked the Top 50 of Billboard’s Top Current Albums. Deathgrip (2016) climbed to Number 5 among Hard Rock Albums. 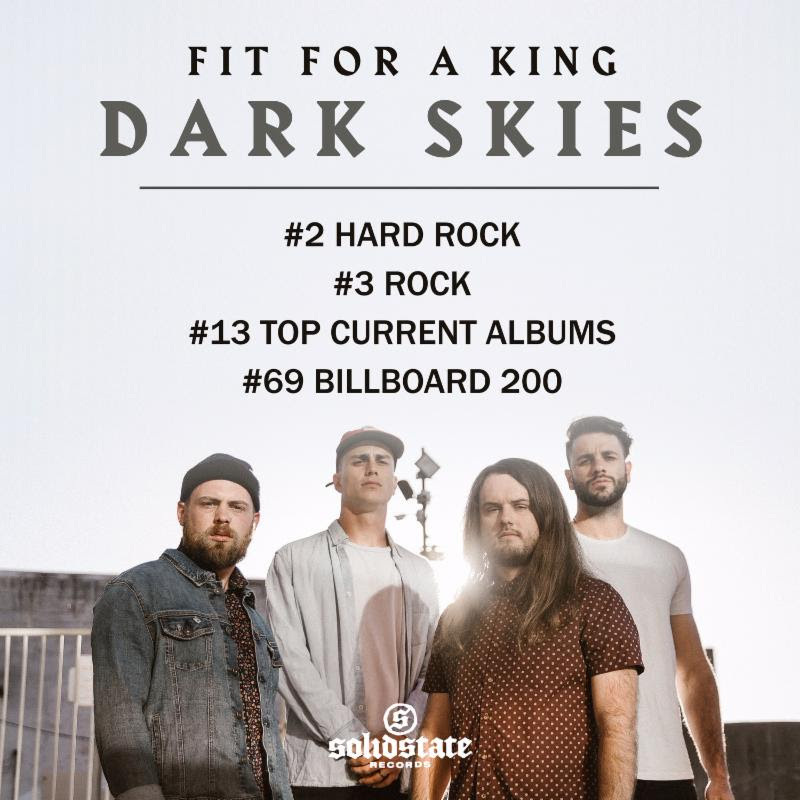 Now, with the band’s latest release, Dark Skies, Fit For A King is looking to, once again, dominate the hard rock/metal-core scene through a collection of diverse anthems powered by the undeniable weight of truth-telling emotional vulnerability.